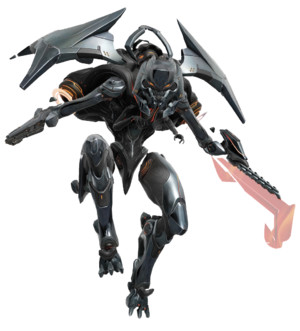 Knight Battlewagons are a class of Promethean Knight and are part of the army of war machines created by the Ur-Didact near the end of the Forerunner-Flood war. Lying dormant within the shield world Requiem for 100,000 years along with their imprisoned master, the constructs were reawakened when the UNSC stumbled upon the installation in late 2557. Battlewagons are the most dangerous and unpredictable of the Promethean Knights and can be considered more of walking weapons than individual combatants. Created for close-quarter combat, Battlewagons are heavily armed and armored, serving as a last line of defense when other forces have failed. Their hulking frames are covered in dense, resilient armor. They employ a variety of weapons from the Promethean arsenal, including LightRifles and Suppressors for long-range combat, and Scattershots for close-quarters combat. They are also capable of deploying autonomous sentries. As of late 2558, Knight Battlewagons are also seen with Incineration Cannons. Battlewagons have been known to singlehandedly lay siege to even the most heavily fortified of sites. They are capable of leaping high towards an enemy and striking them with their swords, an ability only seen in Battlewagons. The Knight Battlewagons of Requiem predominantly distinguished themselves from other classes of Knight by barbs of hard light laced within their armor. These protrusions communicate rank and show excess energy discharge. Their heads are reinforced and have a light pattern resembling an 'X'. Their carapaces also have pyramid-shaped heavy-shield distributors. The Battlewagons have elongated and larger hardlight blades. The Knight Battlewagons seen in late 2558 did not possess this design; instead, their appearance was closer to the more common Knights, but with extra armor around their jaw area. The Battlewagon bears superficial resemblance to the Necrons of the Warhammer 40000 mythos. A Knight Battlewagon in Halo 4. A closeup of a Knight Battlewagon's head. A Battlewagon variant of the Knight from the E3 trailer. The alternate Battlewagon Knight variant, from another angle. John-117 encounters a Knight Battlewagon on the level Shutdown. A Knight Battlewagon battling a pair of Spartan-IVs in Spartan Ops. An early development version of the Battlewagon for Halo 5: Guardians. This version resembles the Halo 4 Battlewagon much more than the final version produced for Halo 5: Guardians. Renders of the Halo 5: Guardians Knight Battlewagon. A Knight Noble in Halo 5: Guardians. A Battlewagon in Halo 5: Guardians. Two Knight Battlwagons on Meridian's space elevator engaging Spartans and miners. Battlewagon about to kill a miner. Face of a Knight Battlewagon. A Mythic Battlewagon on Attack on Sanctum.